Houston, we have a problem…with Ridley Scott’s directing. Despite the fact that his is an extremely well-known name among directors and both “Alien” and “Gladiator” are critically acclaimed films, Scott just keeps proving over and over again that he can create a very visual movie with a star-studded cast; but, his films over the last decade have just not held up to the hype behind his name or the caliber of director he used to be. The Martian is a prime example of when junior executives at motion picture studios decide that a given plot/sub-genre is popular and keep cranking them out. The problem is, by the time the studios pick up on what the public wants, when the next copycat film gets released, often times the public is tired of that kind of movie. This makes the third epic space movie in three years. Pretty sure both Matt Damon and Jessica Chastain just used their same costumes from Interstellar. One thing’s for sure, if NASA was looking for a film to showcase their brand in an indirect effort to increase funding and rally support for the essentially mission-less organization, this may not have been the best one. In many ways, it just showcased their bureaucracy and inefficiency. Perhaps, space travel should be mostly conducted by private organizations with some infrastructural support on the federal level. 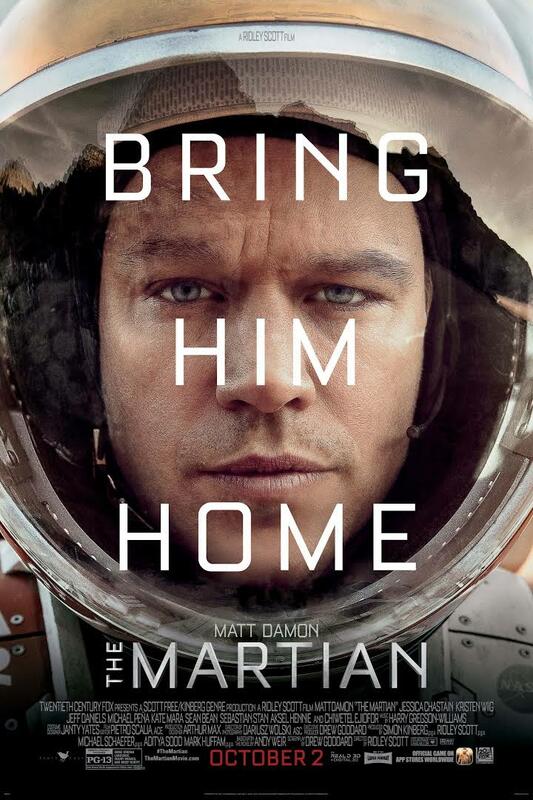 The Martian is about rescuing Mark Watney (Damon) a stranded astronaut-botonist on Mars after a research expedition was abruptly cut short due to an unforeseen storm. The Mars research team, led by Commander Lewis (Chastain), heads back to earth on not knowing that the comrade they thought dead was now completely abandoned on the red planet. Following some minor self-surgery, Watney realizes that he will have to learn to survive on Mars until he can be rescued by growing his own food and repairing the communication technologies in order to make contact with NASA. After NASA discovers the Watney is alive and in reasonably good condition, they must mount an effort to deliver supplies and get him home. Following some failed attempts, NASA eventually teams up with the most unlikely of players in the space game as a collaborative effort to work together for the greater good. Now I know what you may be saying, ‘this guy doesn’t like most high concept, popular movies.’ That is definitely not the case at all. However, I feel that high concept films often suffer from under-developed plots and poorly executed directing. Just because you have a handful of hits such as Alien, Blade Runner, and Gladiator, doesn’t mean that you should be given a pass for all subsequent films. That’s what I and other critics have noticed with his theatrical releases over the last decade. I just don’t think movie-going audiences needed another space movie after Gravity and Interstellar. Certainly not a film about a rescue mission or one with two of the same actors in similar roles from last year. The Martian is definitely beautifully shot, and that is of no surprise, since Scott’s films are often filled with stunning cinematography and production design. If only the actors were just as exemplary in their respective roles. Most of the more prominent roles were just under-developed. Don’t highlight a particular character if there is no real reason for the special attention. Although you may be thinking that I didn’t like this movie at all, you would be mistaken to rush to that conclusion. In fact, there are definitely a few reasons why I liked certain elements of the film. I thoroughly enjoyed the commitment to real science in this science-fiction story. That was my biggest negative criticism of the plot of Interstellar. In the plot of the aforementioned, we were asked to constantly engage in the suspension of disbelief and blindly accept scientific information that was never explained or even made logical sense within the world of the film. Fortunately, The Martian played out as a believable film that is taking place not that far into our future. Throughout the film, the science is explained in carefully crafted exposition that is seamlessly integrated into the plot. Never does it feel that we are to blindly accept some science or logic just for the sake of moving the plot along. The believability of the plot and production design is what helps this film succeed as a good example of a science-fiction theatrical release. As we gear up for Oscar season, I hope that this isn’t what we are to expect: movies that have many great elements paired with poor direction overall. If for no other reason, The Martian shows us how we could colonize Mars and travel back and forth. Although his performance wasn’t stellar, Damon pretty much holds the audience’s attention through the use of comedic relief during some of the most stressful times in the movie. For the aeronautical and and jet propulsion communities, this is a good example of research and development in the area of space exploration. Nice review! I left the cinema very satisfied with this. I had a few minor gripes, but ultimately found an easy path to enjoyment. I particularly liked the sense of humour. On that, we can totally agree! I enjoyed the sense of humor in the film as well. And showing real science in a sci-fi movie was very refreshing.